Permits issued in November and December 2012 are up from the same months in 2011, but not as much as other months. November 2012 was barely up from November 2011 (27 vs. 22). December 2012 vs. December 2011 was up more sharply (34 vs. 18). Time will tell if there is any sort of flattening starting to take place. BPs announced plan to drill ten exploratory wells in 2013 is a positive indicactor. Readers are also reminded that the Utica/Point Pleasant is still a very new shale play, not well delineated at all, and sure to spur interest for a long time to come given some of the encouraging production data that has been shared. It does appear that the western and southern limits of the play are being drawn given the decision by Devon to plug wells in Medina and Ashland county, wells that Devon Executive VP proclaimed "not encouraging". And in the southern region both HG Energy and Antero Resources plugged a number of wells. 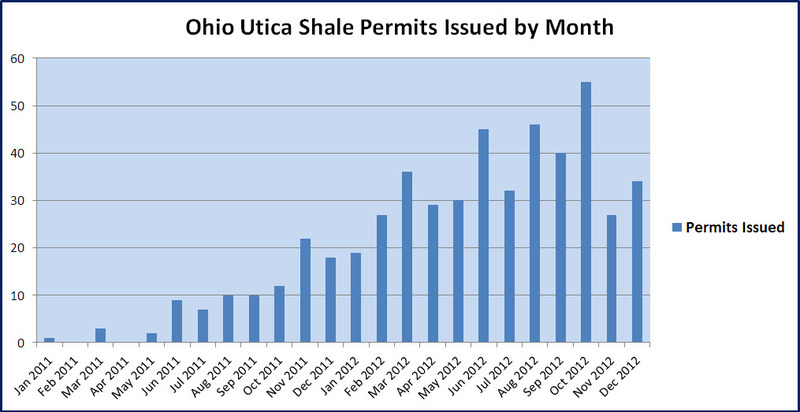 Ohio Utica/Point Pleasant Shale permits issued by month. Source Ohio DNR, Jan 5, 2013 report.